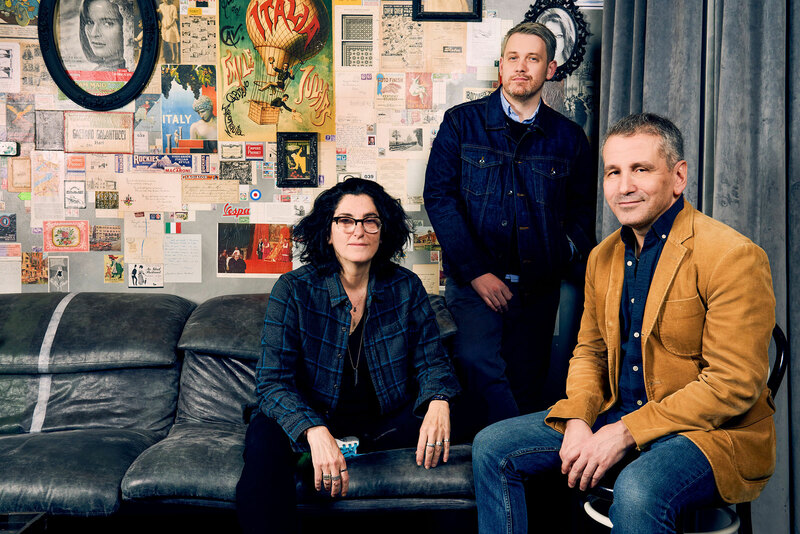 Michael Arden, David Cromer, and Tina Landau have each taken an existing property and reinvented it for the stage. Arden helmed the critically acclaimed revival of “Once On This Island,” a beloved musical from the 1990s that is back on Broadway for the first time since its original production. Landau was tasked by Nickelodeon to build a theatrical world for one of the network’s most popular cartoons with “SpongeBob SquarePants,” and Cromer took the little-known 2007 Israeli film, “The Band’s Visit,” and built it into a charming meditation on life and existence. The three recently gathered at the Arlo Hotel Nomad to discuss their work. What follows is an edited version of their conversation. Each of you adapted an existing property for the stage. How did you approach the material? Michael Arden: For me, I didn’t have to change the words, so it’s probably a different experience than you two had. It was just looking at the words and trying to give the most honest and accurate visual and sonic representation of that onstage. That was sometimes tricky because people have seen it one way, and even the authors know that the last time they saw it, it was brilliant. It’s just about each moment with each element and asking myself why we’re telling this story now and how we can do it both accurately for the time and the fable. Tina Landau: Nickelodeon was very clear from the beginning that they were not interested in a theme-park show, and I was not either. All they said to me was, “If there is new life in this brand, if there’s a way to reimagine it and reinvigorate it in some more unexpected, surprising form, that’s what we’re after.” I was very much left to my own devices, and I feel like the whole process was a little like cooking. It was like gathering ingredients and elements and throwing them in the pot and tasting it and taking this out and putting that in. It was very kamikaze and wild. We knew we wanted to express the DNA of SpongeBob and that world, but we wanted to create our own world. David Cromer: There’s a film of “The Band’s Visit” from 2007, which we always embraced, but we needed to translate it into another form. I think the musical is different than the film, but we were always trying to emulate the sense of space the film has. That lined up with things that I find very moving — stillness, silence, simplicity, not being too big, not being too broad with something. I pushed everyone to keep doing that and not feel any responsibility to jazz it up. Each of the stories you’re telling feels very relevant to what’s going on in the world. Did you think about how your shows’ messages would relate to today’s audiences as you were approaching them? Arden: “Once On This Island” was an interesting show to work on for me as a white, gay boy. Ultimately, I found the story of a black, young woman. I had some fear around that, but had to just say, “Listen, this is not my story to tell, completely.” But luckily I had a company that I could trust and they trusted me. What began to make itself clear, which I hadn’t realized, was that the good that we do in our lives and the protests we attend and the voices we raise in our lifetime, we might not see a return. We might not see absolution or anything like that. But, we have no idea what impact we can have. Landau: On “SpongeBob,” we set out simply to find a story that had high stakes and half-jokingly, the book writer Kyle Jarrow and I thought, “Well, I guess the highest stakes would be the world is going to end. So, let’s do that.” We had no idea that the more time passed and the closer we got to production, the more likely that would seem a plausible reality. Although it is fundamentally a celebration of community and joy that we try to put out into the universe each night, our piece depicts a society that is turning in against itself and learning that the thing most likely to destroy it is not a meteor or a volcano, it’s society itself. Mostly, I think of our show as an antidote to a kind of sobriety. It invites a sense of wonder and joy and play and silliness, which is really needed and appreciated by people in this moment. In each of your shows, you have a star who is breaking out onto the scene. How did you go about casting your shows? When I first met her I thought, she’s not yet an actor and now I’m like, she’s a fabulous actor who I would watch in anything. It’s really so thrilling, I love it. I hope she returns my calls when I, like, ask her to write me a letter of recommendation for my job at Starbucks. Landau: I was thinking that, they’re all very singular. Ethan [Slater] was with us for five years of workshops. We’ve never auditioned for that role since that moment. Ethan is just in the molecular structure of what we’ve made because he IS SpongeBob. Cromer: We’ve all seemed to have landed on perfect leads which makes life infinitely easier. [Katrina Lenk] has made life easier. She had to audition four times honestly because we just kept saying, there’s got to be a catch. Matt Gould worked with her and was like, “This girl is going to be a huge.” And then cut to: She’s amazing. She’s really such a creature. Landau: Can I just say something — I am so grateful for this moment because, as directors, we don’t get to hear each other talk about what we do. Arden: This is a very lonely job. I would love to know more directors and hang out with them and stuff. Cromer: Maybe we’ll have a dinner. Get tickets to “The Band’s Visit” from $49! Get tickets to “Once On This Island” from $89! Get tickets to “SpongeBob SquarePants” from $49!